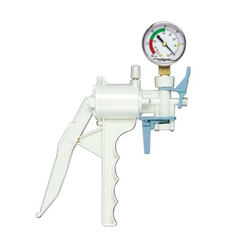 Our range of products include kiwi omnicup delivery system, kiwi vacuum cup, silicone vacuum cups, mityvac reusable hand held pump and flexible vacuum delivery system. We are a coveted business organization engaged in catering to the variegated requirements of the customers by bringing forth Kiwi OmniCup Delivery System. Our offered delivery systems are obtained from the reliable vendors of the industry, who are well known names. Further, these systems are widely applauded for the performance and reliability. Specifically used for cesarean section deliveries during floating head cases. The pressure can be built in the hand and no need of any external pressure source. The device can build a pressure close to 700 mm hg. Properly placed and traction is exerted in line with the pelvic axis. Other end of delivery cup has got a vacuum release button in order to release the pressure built once the procedure is done. Being a client focused organization since our inception, we are involved in supplying and distributing Kiwi Vacuum Cup. Our range of vacuum delivery cups is highly demanded in the market for its precise performance. Our range of cups applies an effective vacuum pressure that maintains the flow of pressure and provides sturdy performance. These cups are used during genitures. The Omni-C™ Cup is designed specifically for caesarean section deliveries and the confined space of the lower uterine segment. 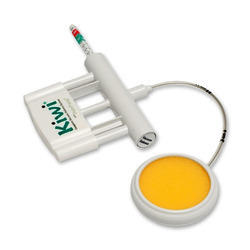 The Kiwi Omni Cup features a low profile and stem-free traction mechanism that make it possible to place the cup safely and correctly over the flexion point of the fetal head (3 cm forward of posterior fontanelle). When the Omni Cup is properly placed and traction is exerted in line with the pelvic axis, mal-position of the fetal head can be corrected so that the optimal diameters present to the birth canal and auto-rotation can occur naturally. 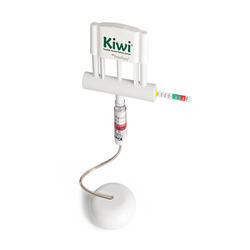 Kiwi Omni cup is mainly used specifically for caesarean section deliveries especially during floating head cases. The pressure can be built in the hand and no need of any external pressure source (In the case of silicon vacuum cup the cup is connected to the external pressure source). The device can build a pressure close to 700 mm. The Omni Cup is properly placed and traction is exerted in line with the pelvic axis. The other end of delivery cup has got a vacuum release button in order to release the pressure built once the procedure is done. We offer a wide range of Silicone Vacuum Cups to our valued patrons at affordable rates. These cups are used to track the baby and are used in hospitals and clinics widely. Our range of cups are reckoned in the market for their top class features and efficiency. We provide these cups in various specifications owing to the needs and requirements of our customers. The vacuum cup is used to track the baby outside from the mother’s womb. Available in 3 different sizes such as small, medium and large. The ideal instrument for vacuum-assisted deliveries. Mityvac Reusable Hand Held Pump requires no electrical power, yet efficiently and reliably provides the vacuum necessary to aid in the delivery of the baby in both vaginal and cesarean births. From the day of commencement, we are engaged in catering to the variegated requirements of the customers by bringing forth Flexible Vacuum Delivery System. Procured from the renowned vendors of the industry, who develop these delivery systems with utmost precision under the guidance of the physicians. Designed specifically for caesarean section deliveries. The confined space of the lower uterine segment. It features a low profile and stem-free traction mechanism. Possible to place the cup safely and correctly over the flexion point of the fetal head (3 cm forward of posterior fontanelle). Looking for Vacuum Assisted Delivery Systems ?